Born on 6 April 1957 in Milan, Italy. His hometown is Verano Brianza, Milan, Italy. He enjoys scuba diving, piloting aircraft, assembly of computer hardware, electronic equipment and computer software. Received a Bachelor of Science in Aerospace Engineering in 1988 and an Master of Science in Aeronautics and Astronautics in 1989 from the Polytechnic University of New York. Awarded the Laurea in Ingegneria Meccanica by the Università degli Studi di Firenze, Italy, in 1990. Military: Master parachutist, parachute instructor, jump master, high altitude low opening, Special Forces operator. Nespoli was drafted by the Italian army in 1977 and became a non-commissioned officer working as a parachute instructor at the Scuola Militare di Paracadutismo of Pisa. In 1980 he joined the 9° Btg d’Assalto “Col Moschin” of Livorno where he became a Special Forces operator. From 1982 to 1984, he was assigned to the Italian contingent of the Multinational Peacekeeping Force in Beirut, Lebanon. Following his return to Italy he was appointed an officer and continued working as a Special Forces operator. Nespoli resumed his university studies in 1985. He left active army duty in 1987. Upon completing his M.Sc. in 1989, he returned to Italy to work as a design engineer for Proel Tecnologie in Florence, where he conducted mechanical analysis and supported the qualification of the flight units of the Electron Gun Assembly, one of the main parts of the Italian Space Agency’s Tethered Satellite System (TSS). In 1991 he joined ESA’s European Astronaut Centre in Cologne, Germany. As an astronaut training engineer, he contributed to the preparation and implementation of basic training for the European astronauts and he was responsible for the preparation and management of astronaut proficiency maintenance. He was also responsible for the Astronaut Training Database, a software system used for the preparation and management of astronaut training. In 1995, he was detached to the EUROMIR project at ESA’s ESTEC establishment in Noordwijk, the Netherlands, where he was responsible for the team that prepared, integrated and supported the Payload and Crew Support Computer used on the Russian space station Mir. In 1996, he was detached to NASA’s Johnson Space Center in Houston, Texas, where he worked in the Spaceflight Training Division on the preparation of training for the ground and in-orbit crews of the International Space Station. In July 1998, he was selected as an astronaut by the Italian space agency (ASI), and one month later, joined ESA’s European Astronaut Corps, whose homebase is the European Astronaut Centre (EAC) in Cologne, Germany. In August 1998, he was relocated to NASA’s Johnson Space Center in Houston, Texas, and assigned to the XVIIth NASA Astronaut class. In 2000 he obtained the necessary basic qualifications for being assigned to a mission on the Space Shuttle and to the International Space Station. In July 2001, he successfully completed the course for operating the Space Shuttle robotics arm and, in September 2003, successfully completed the Extra Vehicular Activities advanced skills training. In August 2004, he was temporarily assigned to the Gagarin Cosmonaut Training Center in Star City (near Moscow/Russia), where he followed the initial training for the Soyuz spacecraft. After that, Nespoli returned to NASA’s astronaut office in JSC/Houston, where he performed proficiency training to maintain the acquired qualifications and attended advanced courses. He also carried out several technical duties for NASA, ESA and the Italian Space Agency (ASI). In June 2006, Nespoli was assigned to the Space Shuttle mission STS-120. 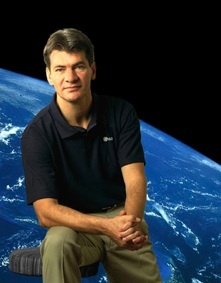 From 23 October to 7 November 2007, Paolo Nespoli flew as Mission Specialist on board Space Shuttle Discovery for the STS-120 flight to the International Space Station. This mission delivered and installed the Node 2, a major building block essential for further expansion of the ISS, including the addition of the European Columbus laboratory. Another important task was the relocation of one of the four solar arrays that provide power to the Station. Nespoli played a key role as the intravehicular activity astronaut (or IVA) for the mission’s spacewalks, including the installation of Node 2. During his mission, named Esperia, Nespoli also performed a number of European experiments for the European scientific community in the area of human physiology and biology. Nespoli also took part in educational activities. In November 2008, Paolo Nespoli has been assigned to Expedition 26/27, a long duration mission to the International Space Station that is planned to take place from November 2010 to May 2011. He recently started his ISS training in Russia and in the US.